DISTRIBUTION: Tropical West Pacific, perhaps Indian Ocean. PHOTO: Ilot Gi, New Caledonia, 12m, March 1982. 11mm long preserved [Holotype] PHOTO: Pierre Laboute. The colour description is based on a photograph provided by Pierre Laboute and a brief note "jaune avec branchies et antennes violets" accompanying the specimen. 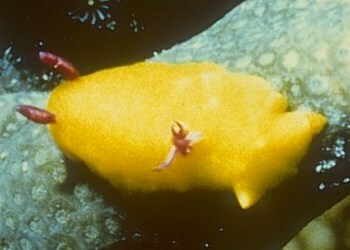 The mantle is bright yellow and the rhinophores and gills are wine red. The simple gills are partially retracted in the photograph but it appears that the lamellae are translucent white with the inner and outer edge and tip of each gill being wine red. Rudman, W.B. (1986) The Chromodorididae (Opisthobranchia: Mollusca) of the Indo-West Pacific: Noumea flava colour group. Zoological Journal of the Linnean Society, 88: 377-404. Rudman, W.B., 2000 (February 11) Noumea laboutei Rudman, 1986.